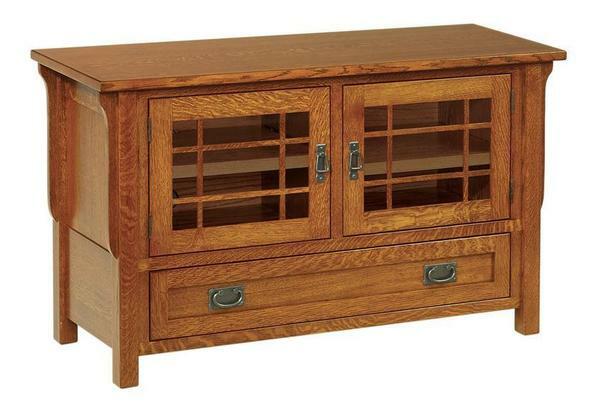 Our Amish Lancaster Mission TV Stand with Drawer is on a mission to make your living room pop with a functional design that will also help to keep your TV viewing needs organized. This mission-style stand pops with solid wood, heirloom-quality construction, corbels, and mullion details on the glass doors. The rectangular design will help add functionality to your living room, bedroom, or office with adjustable shelves behind the lightly smoked glass doors and a CD-DVD accessible dovetailed drawer with maple drawer box and soft-close undermounts. Shown in quarter sawn white oak with Michael's cherry stain and #16 and #17 hardware, choose the wood type, finish, and hardware from a variety of options to customize yours today.